4 How do you feel about a camera? 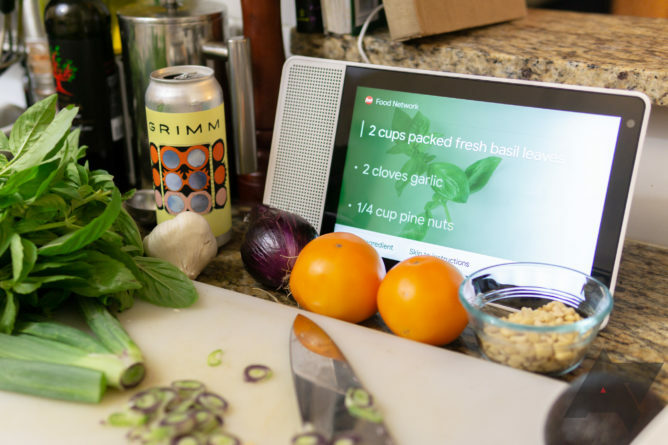 Cooking is possible with the Lenovo Smart Display. Part of the reason you'd want a smart display in the first place is for fast-access to the Google Assistant. The good news is that regardless of which device you pick, the Lenovo Smart Display and Google Home Hub have few disparities in features. Both devices display the time, show you the weather (and the air quality), and can set reminders. All the helpful household-organizing smarts are included, too, like a community shopping list, a broadcasting feature, and a ton of kid-friendly content. Both devices also display the day's agenda, which is helpful if you're attempting to keep track of your daily schedule. 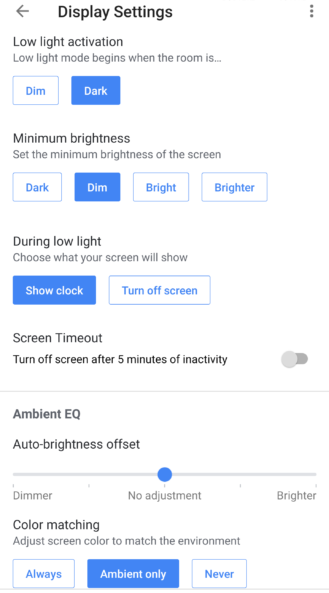 The Google Home Hub's settings panel include an extra set of options for adjusting the Ambient EQ. There are a few subtle differences between the two. For instance, the Home Hub uses an Ambient EQ sensor, which uses the light source in the room to adjust the brightness and the tone of the screen so that appears either vivid in daylight or dim when it's dark. The Lenovo Smart Display also offers an auto brightness feature, though it merely adjusts light emitted from the screen. You'll want to factor that in if you're thinking of putting a smart display directly in your bedroom. The perfect device for watching the best narratives television has to offer. The Lenovo Smart Display and Google Home Hub are both casting devices. While there's currently no access offered for Netflix through Google's smart displays (it still casts through the Chromecast TV dongle), other apps with casting abilities, including music services like Spotify and Pandora, and podcasting apps like Pocketcasts and Google Podcasts, can stream just fine. Both the Lenovo Smart Display and Google Home Hub also support Multi-Room Audio, so you can effectively use one as an entertainment hub of sorts for any other Google Home smart speakers or cast-enabled speakers you have in your home. Not to mention, it's one of the easiest ways to make your entertainment setup look like an intricate operation. Perhaps the only reason you shouldn't consider either smart display is because they're more like portable, AI-infused TVs than they are music players. The louder, 10-watt speakers on the Smart Display are indeed bassy and sound well when paired with other speakers, but you can quickly hear its limit the louder it gets. 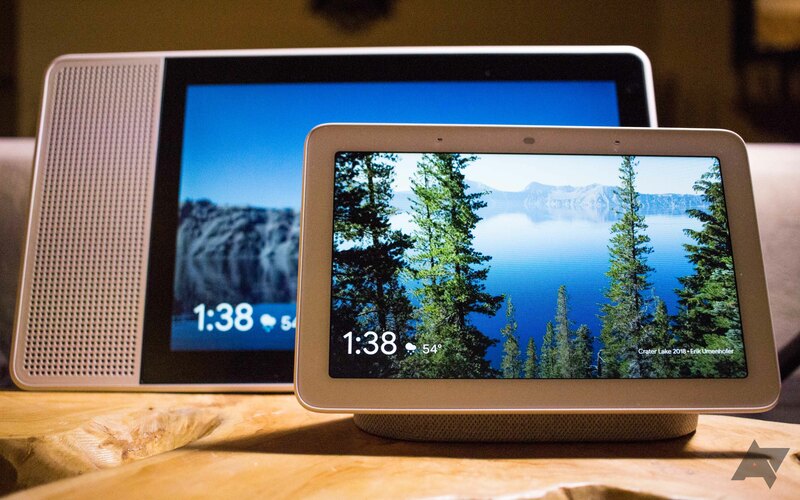 The Google Home Hub, on the other hand, remains small in size and sound and can get tinny when you turn up the volume. If music is your pleasure and the reason you want one of these, stop reading and go check out the JBL Link View. Dim the lights, set the temperature, and easily access your smart home controls with the Google Home Hub. 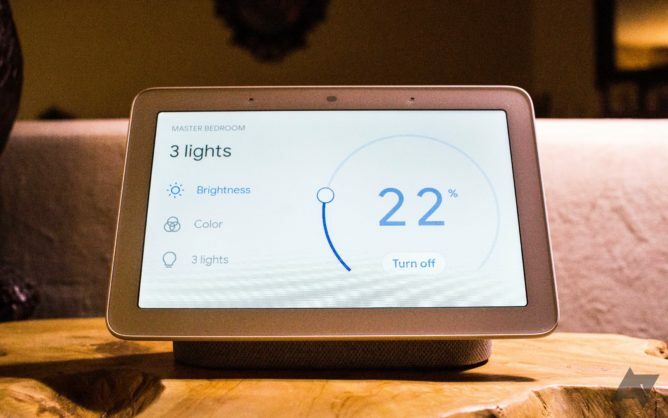 The Google Assistant also brings with it integrated smart home controls, which is probably why Google named its namesake smart display the Home Hub. Both devices can act as Mission Control for your Internet of Things. When you ask it to, the Google Assistant can adjust smart lights, sensors, and appliances, or you can command it quietly through the Google Home app. And since the smart displays are cast-enabled, you can use both devices to check on any live Nest cameras you have installed with a simple voice command. How do you feel about a camera? The Lenovo Smart Display comes with an embedded camera, so if that makes you feel weird, you might rethink it. 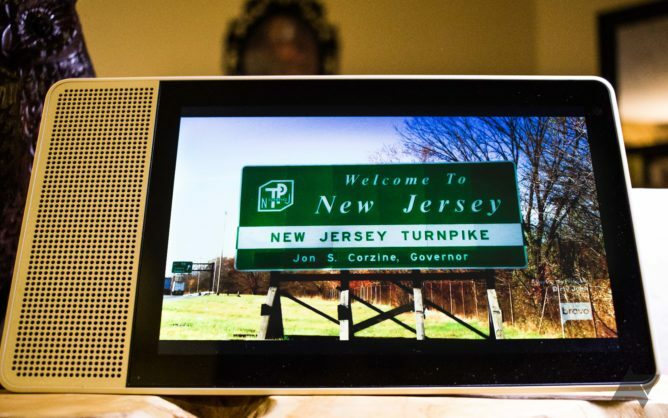 If you're unsure of how you'd feel about having a camera in your bedroom, you shouldn't even consider the Lenovo Smart Display. There's a physical switch to block the lens from peering in when you don't feel like being social, but unless your situation explicitly calls for it, there's no need for a camera. The Home Hub doesn't have a camera, and it was even one of the main selling points on Google's end. Lenovo's offerings are geared more towards families and bustling households where a camera could come in handy. If you're looking for a universal social portal of sorts, so the kids can easily video call relatives through Google Duo, the 5-megapixel wide-angle camera on the Smart Display will do the job. 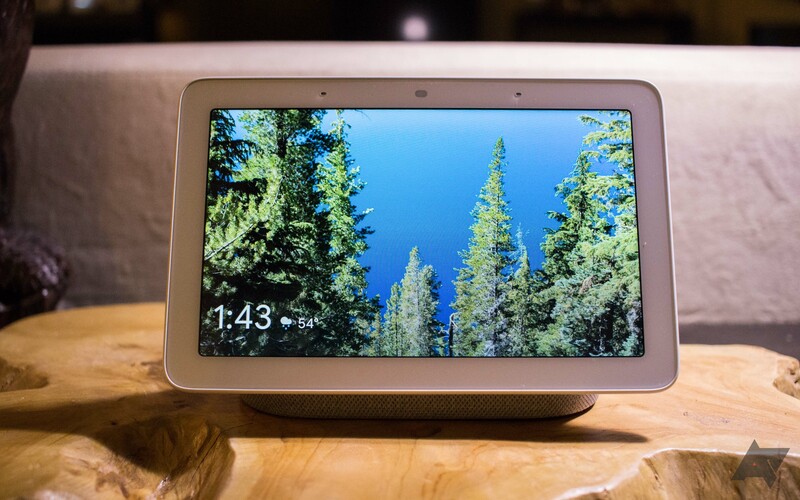 But if you'd rather not, or you don't mind having audio-only Duo calls, the Google Home Hub is just fine. The Home Hub makes a great digital photo frame. Regardless if you choose the Lenovo Smart Display or Google Home Hub, both devices make perfect dynamic photo frames for your Google Photos. The app now offers Live Albums that automatically update with pictures of the people and animals you specify. It's a great way to get a memory-bomb as you're walking through your bedroom or the communal hallway in your house. And while Lenovo's competing devices have access to the Ambient screensaver, you might consider the Google Home Hub for the photo-displaying job just because that's what it was made to do. Now that we've armed you with information for making your choice, here's where to buy the Google Home Hub and Lenovo Smart Display on sale. As of this posting, Best Buy has the best deal for the Google Home Hub. It's $99 for the device ($50 off the original price), plus $10 in Best Buy credit. Wal-Mart is also offering $10 back, though it's towards the VUDU streaming service, which you might want if you're missing an essential holiday flick in your movie library. The Google Home Hub will also be $99 at Target, Lowe's, Kohl's, and even Jet, which started its promotion on the eve of November 21. If you buy it directly from the Google Store, it's also $99. Some carriers have it on sale, too, including U.S. Cellular, which lets you pay for it incrementally through your monthly phone bill. 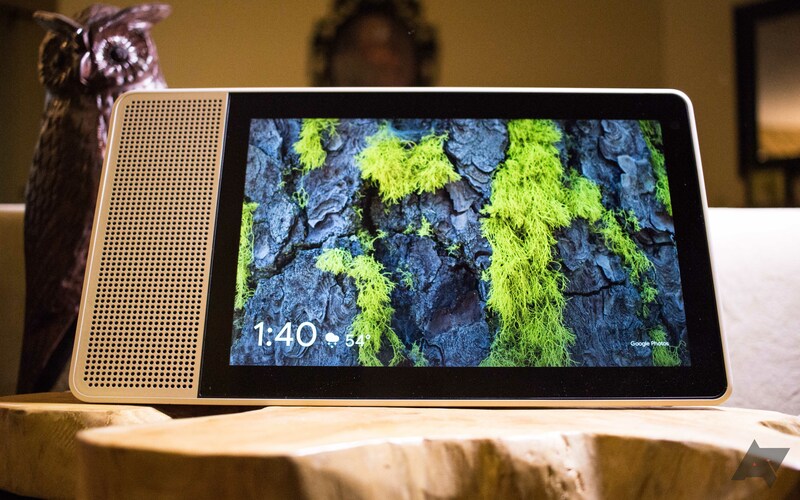 The Lenovo Smart Display has also been reduced, but only the 8-inch version has a good deal. Wal-Mart and various other retailers are offering it for $100—that's 50 percent off. The 10-inch model is $150 at Costco right now ($50 off, but of course requires a membership), and also in Best Buy's "up to 35 percent off" section that goes live on Black Friday, though it's little savings, and not much of a deal compared to the price-slash on the 8-inch variant. Ultimately, your choice this holiday season is this: Do you want a bassy smart display with an integrated camera, or does the small, unassuming Google Home Hub seem more your aesthetic? Both are worth considering at the $100 price point.